BabelStone Flags v. 2.08 is a font that supports multicolour flag glyphs for Unicode character sequences representing various national, sub-national, supra-national, and miscellaneous flags. The font is under development, and does not yet support all national flags of the world. The current version of the font includes glyphs for 164 flags in total. The font uses the COLR/CPAL format for layered colour fonts, which is supported by all major browsers (including IE11, Edge, Firefox, and Chrome). The colour flags for national flags (represented as Regional Indicator Sequences) should display correctly on the latest versions of all browsers as well as in Microsoft Word 2016, but the colour flags for sub-national regions (represented as Flag Emoji Tag sequences) do not currently display in IE11 and Edge browsers (works OK in Firefox and Chrome). This font supports the two mechanisms for representing country and region flags described in the proposed update to Unicode Technical Standard #51 (Unicode Emoji): Regional Indicator Sequences and Flag Emoji Tag Sequences. These sequences are defined in the Emoji 5.0 data. These are sequences of two Regional Indicator letter symbols (1F1E6..1F1FF = A..Z) corresponding to ISO 3166-1 alpha-2 two-letter country codes (technically the Unicode Standard references Unicode region subtags defined in CLDR, which are derived from ISO 3166-1 codes). For example, the country code for USA ("US") is represented by the Unicode character sequence <1F1FA 1F1F8> (RIS-U, RIS-S). If a particular RI sequence is not supported, it should fallback to displaying as two individual Regional Indicator letter symbols (generally a boxed capital letter A through Z). As the boundary between adjacent RI sequences is not indicated at the encoding level, it is possible to get unexpected diplay results for consecutive sequences of more than two RI symbols. For example, you may put a sequence of four RI symbols AQAZ on your web page, which you intend to render as the flags of Antarctica (AQ) and Azerbaijan (AZ), but if a visitor's browser does not support the flag of Antarctica the result for them may be the flag of Qatar (QA) sandwiched between orphaned RI symbols A and Z. To avoid getting the wrong flags displayed it is safest to separate consecutive RI sequences with a space character or punctuation mark. BabelStone Flags currently supports flags for 105 countries, territories or international entities with an ISO 3166-1 code, including all the countries of Europe. It also supports the historic flag of the Soviet Union (SU), even though this is not conformant to the Unicode Standard as the ISO 3166-1 code SU is exceptionally reserved (but as it is exceptionally reserved the code cannot be used for anything else, and so it is safe to use it for the flag of the Soviet Union). Tag characters are default ignorable and invisible, so if a flag tag sequence is not supported on a particular system it will fallback to displaying as a waving black flag. Thus, if you have a web site showing two different flag characters together (for example the England and Scotland flags), they may display correctly on your browser, but some visitors using different browsers may only see two identical waving black flags, which can be a little confusing ! Austria: Burgenland (AT-1), Kärnten (AT-2), Niederösterreich (AT-3), Oberösterreich (AT-4), Salzburg (AT-5), Steiermark (AT-6), Tirol (AT-7), Vorarlberg (AT-8), Wien (AT-9). Belgium: Brussels-Capital Region (BE-BRU), Flemish Region (BE-VLG), Walloon Region (BE-WAL). Canada: Newfoundland and Labrador (CA-NL), Nunavut (CA-NU), and Quebec (CA-QC). Ireland: Connacht (IE-C), Leinster (IE-L), Munster (IE-M), and Ulster (IE-U). Spain: Catalonia (ES-CT), and Basque Country (ES-PV). Switzerland: Fribourg (CH-FR), Luzern (CH-LU), Neuchâtel (CH-NE), Solothurn (CH-SO), Schwyz (CH-SZ), Ticino (CH-TI), Valais (VS), Zug (CH-ZG), and Zürich (CH-ZH). United Kingdom: England (GB-ENG), Scotland (GB-SCT), Wales (GB-WLS), Northern Ireland (GB-NIR); Anglesey (GB-AGY), Cornwall (GB-CON), Devon (GB-DEV), Dorset (GB-DOR), Flintshire (GB-FLN), Monmouthshire (GB-MON), Northumberland (GB-NBL), Orkney Islands (GB-ORK), Pembrokeshire (GB-PEM), Surrey (GB-SRY), Vale of Glamorgan (GB-VGL), and Shetland Islands (GB-ZET). United States: Alaska (US-AK), California (US-CA), Hawaii (US-HI), and Texas (US-TX). Only three of these are recommended for implementation by the Unicode Consortium (flags for England, Scotland, and Wales), but the rest are not recommended not to be implemented. Note that there is no official flag for Northern Ireland, but as the Ulster Banner is used to represent Northern Ireland in major international sporting competitions such as the FIFA World Cup, this flag is used for GB-NIR in BabelStone Flags. The synonym for Wales, GB-CYM, defined in BS 6879 but not listed in ISO 3166-2, is also supported in BabelStone Flags. BabelStone Flags also includes four flags for historic English, Scottish and Welsh counties that do not have an ISO 3166-2 code. In these cases I have made up an unofficial GB code with "X" as the first letter of the subdivision code (e.g. GB-XCR for Caernarfonshire). These are indicated with three stars in the table of Flags for ISO 3166-2 Country Subdivision Codes below. There are two official flags for Bavaria, one striped and one with lozenges. In my font the striped flag is the default, but the striped and lozenge versions can be selected by applying VS1 and VS2 respectively after the waving black flag. However, this hack only works under the Firefox browser. BabelStone Flags also supports Flag Emoji tag sequences for ISO 3166-1 two-letter country codes (i.e. the US flag can be represented either as <1F1FA 1F1F8> or as <1F3F4 E0075 E0073 E007F>). I am unclear from the rather imprecise description of Flag Emoji tag sequences given in Annex C of Unicode Technical Standard #51 whether this is conformant with the Unicode Standard or not; but it seems logical to support all geopolitical flags as tag sequences. Note that there is some confusion about the placement of the variation selector (VS-16) in these sequences, with it being placed after the first graphic character in the case of the Rainbow Flag, but at the end of the sequence in the case of the Pirate Flag. BabelStone Flags supports both placements for both flags, as well as sequences with the variation selector omitted. I have tested BabelStone Flags under Windows 10 on the latest versions of Chrome, Edge, Firefox and Internet Explorer, and they all display the Rainbow flag correctly, and all but Chrome display the Pirate flag correctly. Firefox, Edge and Internet Explorer display the Rainbow and Pirate flags with either VS-15 (text display) or VS-16 (emoji display), but Edge and Internet Explorer do not display the Pirate flag unless it has either VS-15 or VS-16 (they display the Rainbow flag with or without VS-15 or VS-16). Only Chrome does not display the Rainbow flag if it has VS-15. 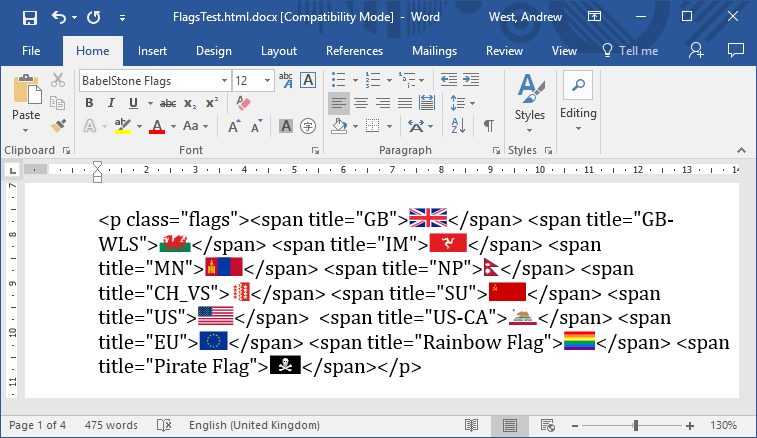 The Rainbow and Pirate flags also display correctly on Microsoft Word 2016. The colour glyphs are created using the High-Logic FontCreator font editor. The glyphs are not emoji-style (waving flag), but attempt to accurately reproduce the proportions and colours of the flags as a flat design. All flag glyphs have the same height, but have differing widths depending upon the flag proportions (1:1, 1:2, 2:3, and 3:5 being the most common proportions). Except for the flag of Nepal, all glyphs are square or rectangular in shape, with no flagpole. The glyphs do not have an added border line, so if displayed on a white background any flags with a white background or large sections of white (e.g. flags for Japan, Korea, Russia, and Zug) merge into the surrounding background. It is therefore best to display the flags on a background colour that is not normally used as a flag colour, such as light grey or beige. If a particular software application supports the OpenType features used to substitute single glyphs for Regional Indicator sequences or flag emoji tag sequences, but it does not support the colour glyph format, then it will display fallback monochrome glyphs provided by the BabelStone Flags font. These monochrome glyphs are all in the form of a waving flag (with a flagpole on the left) with the two-letter ISO 3166-1 alpha-2 code on the flag. For flags corresponding to ISO 3166-2 subdivision codes the two- or three-letter code after the hyphen is placed under the flag. Due to a bug in Chrome which displays the width of the colour glyphs as the width of the fallback monochrome glyph, the monochrome glyphs in BabelStone Flags have two dots on either side of the flag so that the monochrome glyph is exactly the same width as the corresponding colour glyph. The quality of the fallback glyphs is quite poor, and may be improved in the future. The tables below render each flag character in the BabelStone Flags font, either using the font installed on your local machine or using a WOFF font if the font is not installed on your local machine. Supported sequences are also listed at my Flags Test page. Codes marked with three stars (***) are unofficial codes that I have devised for places that do not have an ISO 3166-2 code. BabelStone Flags 1.00 2014-04-03 Experimental test font (several test versions during 2014–2016). BabelStone Flags 2.00 2017-04-01 First formal release, supporting 28 Regional Indicator sequences, 27 Flag Emoji tag sequences, rainbow flag, and pirate flag. BabelStone Flags 2.01 2017-04-05 Added 7 Regional Indicator sequences and 15 Flag Emoji tag sequences. BabelStone Flags 2.02 2017-05-03 Added 36 Regional Indicator sequences. BabelStone Flags 2.03 2017-11-11 Added 10 Regional Indicator sequences. BabelStone Flags 2.04 2017-12-07 Added 1 Regional Indicator sequence and 1 Flag Emoji tag sequence. BabelStone Flags 2.05 2018-02-10 Added 1 Regional Indicator sequence. BabelStone Flags 2.06 2018-07-19 Added 2 Regional Indicator sequences. BabelStone Flags 2.07 2018-09-27 Added 8 Regional Indicator sequences and 3 Flag Emoji tag sequences. BabelStone Flags 2.08 2019-03-30 Added 9 Flag Emoji tag sequences for the states of Austria. BabelStone Flags is licensed under the SIL Open Font License 1.1, which means you are free to use it for personal or commercial purposes, and to redistribute it by itself or as part of a free or commercial software package, just as long as you do not sell the font on its own. The license also allows you to modify the font in any way you like, as long as the modified font does not use "BabelStone" in its name. Please read the license for details. You may download the WOFF or WOFF2 version of the font, and host it on your server if you wish, but you cannot use the WOFF file at babelstone.co.uk on other websites. If you find this font useful, please consider making a small donation to me via paypal.